Updated Friday February 10, 2017 by EHTBA. This program is for 6 year olds moving from the tee to the pitching machine. The season generally begins in mid- late April and runs to early June. 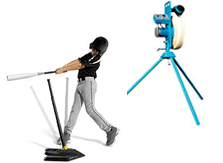 All players have the opportunity to hit against the pitching machine. If they do not make contact during their at bat, a coach will position a tee for them to put the ball in play. As the season progresses many will be consistently making contact with balls from the pitching machine. How many volunteer coaches do we have? How many registered players can we support?